We’re moving into full cherry blossom season now, and I bet you’re wondering where to see cherry blossom at Easter. 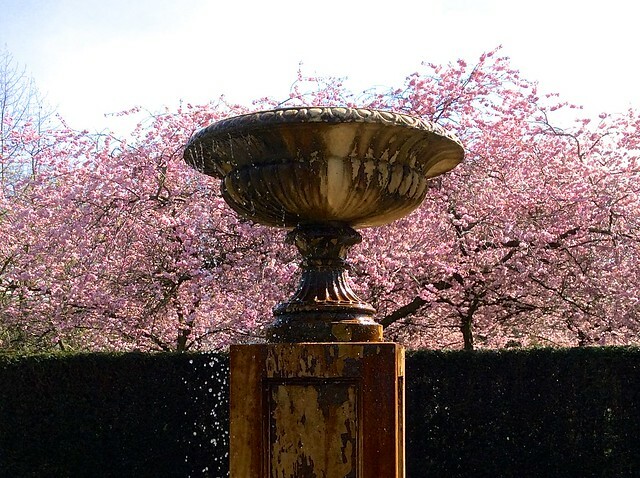 Take a look at my London Cherry Blossom Guide for my top five spots. Today, as part of my regular series of updates on the progress of the blooms, I’m doing a report on the current state of the blossom in Regent’s Park. It’s good and bad news if you’re planning to go cherry blossom viewing over Easter. The good news is, there’s some lovely blossom to be seen, but on the other hand I estimate the high point of the season is still a week away (though a burst of warm weather could bring the blossom out sooner). Here’s how things are looking in Regent’s Park. The early, single-flower blossom I showed in my first update is pretty much over. But the grove of pink-blossomed trees at the south end of Avenue Gardens has come into its full glory. This grove has been joined by a white-blossomed tree, making a lovely mix of pink and white blossom. The small grove of white cherry trees just the other side of York Bridge road, in front of Cornwall Terrace, was still mainly in bud when I was there a couple of days ago, with just a few branches in flower. But it’s probably moved on a bit by now. The blossom in the English Garden is yet to come – I’d give it another week. if you want to see what it will be like, take a look at my Regent’s Park virtual tour. Remember, the avenue of pink cherries on Chester Road has been cut down and will not be replaced until next year. All photos in this post were taken on 2nd April – yes, it really was that sunny! I’ll be updating again in about a week’s time, depending on the weather. I plan to cover Kew Gardens (where you’re always sure of good blossom) and Greenwich Park in future posts. This entry was posted in Cherry Blossom, Flowers and plants, Regent's Park and tagged flowers, London, nature, plants by Fran. Bookmark the permalink. Yes, and more to come! Thank you so so much for these beautiful images. My daughter, who is half-japanese has moved to London and would LOVE to see the sakura in all its glory. Well, this is the right time – and hopefully we’re going to get some good weather too. Love the drama of the last photo. Thank you – I had to wait ages for a group of tourists to move on before I could get the shot. Dear Fran thank you for all the lovely visits and update. Can you advise if there are still any good spots to view in or around London as we move towards mid April ? Alexandra Palace is great right now, and so is Kew Gardens. The blossom is late this year, so there’s plenty more to come in Regent’s Park and at Kew. In Greenwich Park the cherry blossom avenue is still in bud at the moment. I’d recommend Kew Gardens. You’re sure of good blossom there. I hear the blossom in the English Garden in Regent’s Park isn‘t fully out yet.